Council meetings are recorded and live streamed to the Internet for public viewing. By entering the Chambers during an open session of Council, you consent to your attendance and participation being recorded. The recording will be archived and made available on Council’s website www.begavalley.nsw.gov.au. All care is taken to maintain your privacy; however as a visitor of the public gallery, your presence may be recorded. 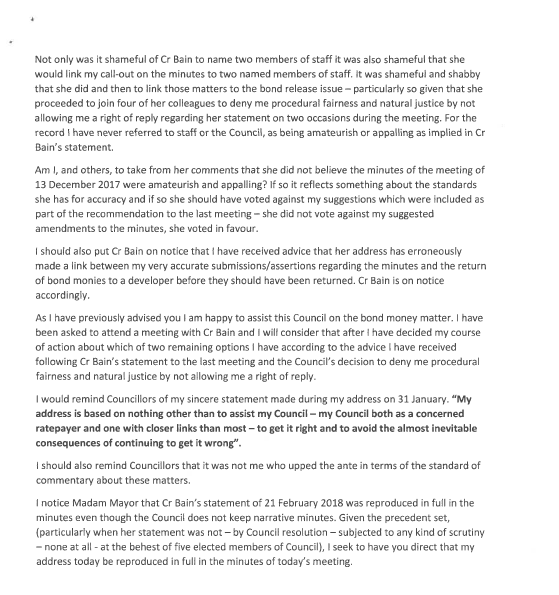 Cr Bain declared that due to the impending issues she believed were to be raised, she would like to be excused from the meeting for the deputation. 02:02 pm Cr Bain left the meeting. The Mayor stated that Council would hear deputations before the adoption of the minutes. Mr Jesson addressed the meeting. RESOLVED on the motion of Crs Tapscott and Allen. 02:15 pm Cr Bain returned to the meeting. 1. 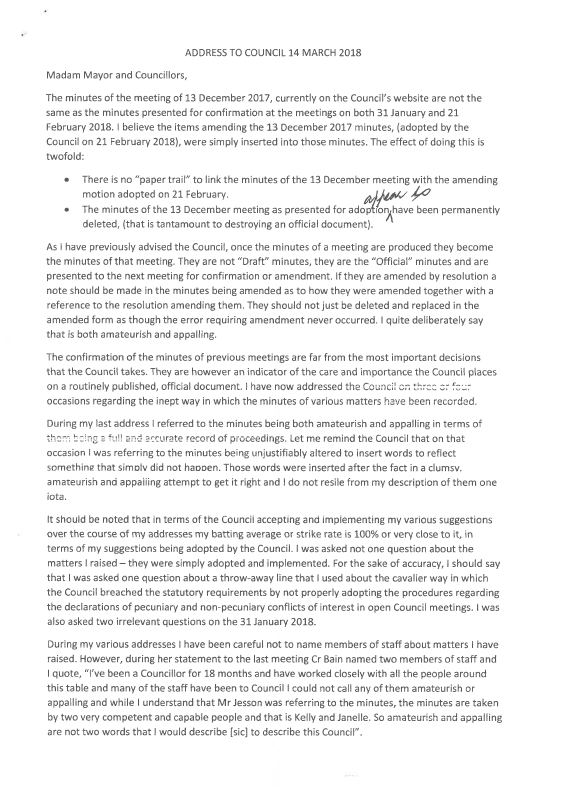 That the Minutes of the Ordinary Meeting held on 21 February 2018 as circulated, be taken as read and confirmed. Cr Fitzpatrick declared a non-pecuniary interest regarding Item 10.2, Section 355 General Sportsgrounds Committee Motions for Council Consideration on the basis that he is a member of Council’s appointed Pambula Sporting Committee. A signed declaration form was tabled by Cr Fitzpatrick for inclusion in the Register, noting Cr Fitzpatrick will remain in the meeting room and take part in debate and voting on this item. Cr McBain declared a non-pecuniary interest regarding Item 12.1, Bega Valley Local Traffic Committee - 182.RT.012 Merimbula Public School Traffic Management, Merimbula– Late Item on the basis that two of my children attend Merimbula Public School. A signed declaration form was tabled by Cr McBain for inclusion in the Register noting Cr McBain will depart the meeting room, taking no part in debate or voting on this item. There were no reports to standing committees. There were no Planning and Environment reports. 1. That Council note the due diligence investigations that have been undertaken on Bega sites. 2. That Council redevelop the Bega Valley Regional Gallery at its current location. 3. That Council delegate the authority to the General Manager to proceed with the Bega Valley Regional Gallery Redevelopment project application for Round 2 funding of the NSW Cultural Infrastructure Program. An amendment was proposed by Cr Nadin. 2. That Council redevelop the Bega Valley Regional Gallery at its current location dependant on receipt of external funding. Crs Tapscott and Griff accepted this amendment. 3. That Council delegate the authority to the General Manager to proceed with the Bega Valley Regional Gallery Redevelopment project application for an amount that accurately reflects the requirements that ensure that the proposal meets the current and future building on the site in Round 2 funding of the NSW Cultural Infrastructure Program. It was put to the vote and CARRIED. Cr Fitzpatrick declared a non-pecuniary interest regarding Item 10.2, Section 355 General Sportsgrounds Committee Motions for Council Consideration on the basis that he is a member of Council’s appointed Pambula Sporting Committee. A signed declaration form was tabled by Cr Fitzpatrick for inclusion in the Register. Cr Fitzpatrick remained in the meeting room, and took part in debate and voting on this item. 1. That Council note it is required to utilise revenue raised through the 2013/14 Special Rate Variation application (which included recreation facilities and access roads in year two) in line with Independent Pricing and Regulatory Tribunal of New South Wales’ Determination of June 2013. 2. That Council note the Committee’s support for a useable and effective bookings system for the organisation and support officers to continue to explore suitable options. That Council defer discussion on Item 1 due to the fact that the sports committee are assessing the matters relating to this report. Cr Allen withdrew his foreshadowed motion. 3. That the matter of the special rate variation be referred to a Councillor workshop for further discussion. 2. That Council allocate $5,000 from the Festivals and Events budget to the Eden Whale Festival for the purposes of the general running of the Festival including but not limited to hire of marquees, tables, chairs, security and sound system for performers/stage area. 3. That officers notify the applicant of Council’s decision. 1. That Council authorise the Mayor and General Manager to execute the necessary lease documentation to provide a further tenure of three years to each of the existing lessees at the Merimbula Airport as detailed in the report to Council of 14 March 2018. 2. That Council’s formal written consent is required to any and all future sub leasing arrangements at the airport to ensure that such sub tenancies do not conflict with or impede operation of the site as a regional airport. 3. That the Lessee will incur an additional annual lease fee, payable to the Lessor of $5,000 or 20% of the annual sub-lease fee whichever is the lesser for any sub-lease approved by the Lessor. There were no Economic Development and Business Growth. Cr Dodds acknowledged the passing of Stephen Hawking. Cr McBain declared a non-pecuniary interest regarding Item 12.1 Bega Valley Local Traffic Committee - 182.RT.012 Merimbula Public School Traffic Management, Merimbula– Late Item on the basis that her two children attend Merimbula Public School. A signed declaration form was tabled by Cr McBain for inclusion in the Register. 03:27 pm Cr McBain left the meeting. Cr Seckold assumed the role of the Chair. 1. Council approve the installation of a “No Stopping” zone, for a length of 175 metres along the shared boundary of Sapphire Coast Drive and Tura Beach Woolworths and part of the shared boundary of Sapphire Coast Drive and lot 31 DP 243029 to the southern side of the access driveway of lot 31. 1. That, subject to conditions, Hoskins Street, Bemboka be temporarily closed between the intersections of Kameruka Street and Nimmitabel Street from 7.00am and 6.00pm on Saturday, 24 March 2018 for the 2018 Bemboka Triathlon. 2. That, subject to conditions, Sams Corner Road, Bemboka be temporarily closed between the intersections of Nimmitabel Street and Lookout Lane from 7.00am and 6.00pm on Saturday, 24 March 2018 for the 2018 Bemboka Triathlon. 3. That, subject to conditions, Kameruka Street, Bemboka be temporarily closed between the intersections of Hoskins Street and first driveway access east of the Bemboka Pool from 7.00am and 6.00pm on Saturday, 24 March 2018 for the 2018 Bemboka Triathlon. 4. That the proposed traffic arrangements involving the temporary closure of Hoskins Street, Sams Corner Road and Kameruka Street, Bemboka for the 2018 Bemboka Triathlon on Saturday, 24 March 2018, be deemed a Class 2 special event and it be conducted under an approved Traffic Control Plan, in accordance with the Roads and Maritime Services (RMS) Traffic Control Manual. 5. That persons involved in the preparation and implementation of the Traffic Control Plan must hold the appropriate RMS accreditation. 6. That organisers fully implement an approved Special Event Transport Management Plan. 7. That organisers have approved public liability insurance of at least $20 million indemnifying Council, Police and Roads and Maritime Services by name for the event. 8. That organisers have written Police approval prior to conducting the event. 9. That the event achieves all conditions of Council’s issued Use of Public Land approval. 1. That the proposed traffic arrangements for the Candelo RSL Sub Branch Anzac Day March and Service on Wednesday, 25 April 2018 be approved and deemed a Class 2 special event. 2. That the section of William Street, Candelo between the intersections of Eden Street and Queen Street be temporarily closed on Wednesday, 25 April 2018 for the Candelo RSL Sub Branch Anzac Day March and Service, in accordance with Traffic Control Plan. 1. That the proposed traffic arrangements for the Eden RSL Sub Branch Anzac Day March on Wednesday, 25 April 2018 be approved and deemed a Class 2 Special Event. 2. That sections of Chandos Street, Imlay Street, Bass Street and Calle Calle Street, Eden be temporarily closed on Wednesday, 25 April 2018 for the Eden Sub Branch Anzac Day March, in accordance with the Traffic Control Plans. 1. That the proposed traffic arrangements for the Merimbula RSL Sub Branch Anzac Day Dawn Service, March and Service in Merimbula on Wednesday, 25 April 2018 be approved and deemed a Class 2 special event. 2. That the proposed traffic arrangements for the Merimbula RSL Sub Branch Anzac Day March and Service in Pambula on Wednesday, 25 April 2018 be approved and deemed a Class 1 special event. 3. That sections of Main Street, Market Street and Beach Street, Merimbula and Quondolo Street (Princes Highway), Pambula be temporarily closed on Wednesday, 25 April 2018 for the Merimbula RSL Sub-Branch Anzac Day Dawn Service, March and Service in Merimbula and March and Service in Pambula, in accordance with the Traffic Control Plans. 4. That the temporary closure of the Princes Highway, Pambula is a matter solely for NSW Roads and Maritime Services Road Occupancy Licence determination. 1. That the proposed traffic arrangements for the Cobargo RSL Sub Branch ANZAC Day March on Wednesday, 25 April 2018 be approved and deemed a Class 1 special event. 2. That sections of Cobargo Bermagui Road and Tarlinton Street, Cobargo be temporarily closed on Wednesday, 25 April 2018 for the Cobargo RSL Sub Branch ANZAC Day March, in accordance with Traffic Control Plan. 3. That the temporary closure of the Princes Highway, Cobargo is solely for NSW Roads and Maritime Services determination. 1. That the proposed traffic arrangements for the Bega RSL Sub Branch Anzac Day March and Service in Bemboka be approved and deemed a Class 1 Special Event. 2. That the proposed traffic arrangements for the Bega RSL Sub Branch Anzac Day Dawn Service, March and Service in Bega, Anzac Day March and Service in Tathra be approved and deemed a Class 2 Special Event. 3. That sections of Council roads at Gipps Street and Carp Street in Bega, Loftus Street in Bemboka, Bega Street and the Bega Street service road in Tathra be temporarily closed on Wednesday, 25 April 2018 for the Bega RSL Sub Branch Anzac Day proceedings, as per the Traffic Control Plans. 4. That the temporary closure of the Snowy Mountains Highway, Bemboka is solely for NSW Roads and Maritime Services determination. 1. That, subject to conditions, Upper Cobargo Road, Stoney Creek between the intersections of the Princes Highway and Snowy Mountains Highway be temporarily closed between 12.00pm and 6.30pm on Saturday, 9 June 2018 for the duration of a competitive stage of the Bega Valley Rally. 2. That, subject to conditions, Buckajo Road, Buckajo between the intersections of Snowy Mountains Highway and Spring Creek Road is temporarily closed between 12.00pm and 6.30pm on Saturday, 9 June 2018 for the duration of a competitive stage of the Bega Valley Rally. 3. That, subject to conditions, The Snake Track, Kiah between the intersections of the Princes Highway and Towamba Road be temporarily closed between 08.30am and 5.00pm on Sunday, 10 June 2018 for the duration of a competitive stage of the Bega Valley Rally. 4. That the proposed traffic arrangements involving the temporary closure of sections of Upper Cobargo Road, Buckajo Road and The Snake Track for the Bega Valley Rally on Saturday, 9 June 2018 and Sunday, 10 June 2018, be deemed a Class 2 special event and it be conducted under an approved Traffic Control Plan, in accordance with the NSW Roads and Maritime Services (RMS) Traffic Control Manual. 5. That persons involved in the preparation and implementation of the Traffic Control Plan must hold the appropriate NSW RMS accreditation. 7. That organisers have approved public liability insurance of at least $20 million indemnifying Bega Valley Shire Council, NSW Police and NSW Roads and Maritime Services by name for the event. 8. That organisers obtain approval from the Commissioner of NSW Police or their delegate, under Section 115 of the Road Transport Act 2013, prior to conducting the event. 9. That signage be displayed advising of Road Closures. 10. That letters be sent to landowners seeking written approval for the closure of private gates. 11. That a Traffic Management Plan is required stating that private gates are locked in accordance with CAMS guidelines. The Bega Valley Local Traffic Committee agrees an accessible car space needs to be provided along Bunga Street; however this will need to be undertaken as part of the revised Bermagui CBD Masterplan and its final location/s needs to be considered in a broader sense. 1. That the design be finalised and supporting information presented to the LTC for approval. 03:31 pm Cr McBain returned to the meeting. That the Motions be dealt with separately. That ALGA advocates on behalf of local government that Financial Assistance Grants should be increased to at least 1% of national taxation revenue at the 2019/2020 budget. That ALGA advocate to the Federal Government, through the Minister for Transport and Infrastructure and also the Minister for Regional Development, that the Princes Highway between Sydney and Melbourne should be considered a Road of National Importance which would then attract federal government funding. That ALGA advocate to the Federal Government through the Minister for Regional Development, that a decentralisation policy will assist regional and rural areas in terms of population growth, investment and job creation. That ALGA set a renewable energy target equal to those of the ACT to be 100% by 2025 and advocates to the Federal Government through the Minister for Energy and Environment, to assist Local Government financially to implement their own renewable energy targets. 1. That Council receive and note the attached reports indicating Council’s investment position. 2. That Council note the certification of the Responsible Accounting Officer. The Mayor reported she attended the following meetings and will be providing a report to the Councillors. · There were a number of presentations including Wagga Wagga City Council and Wingecarribee Shire Council. There were no rescission/alternation motions. That Council refer to the operational plan and budget development for the 2018/19, a project to engage, via short term of contract, several additional Compliance Officers to be placed in the major towns CBDs of the Shire for a trial period of three months to address parking compliance. The response published in the Agenda for the meeting of 14 March, 2018 was noted. Cr Cathy Griff asked if the Applicants Community Impact report concerning application for liquor licence in Woolworths Bermagui mentions that Council was invited to respond but not doing so. On the contrary, I understand Council did respond. Can Mr Basford please confirm that Council did respond and if so what was the substance of that response? Director Community Environment & Planning, Anthony Basford reported that Council did respond directly to the Liquor and Gaming NSW, which you are able to do under the arrangements of the community impact statement. Council did pick up on the fact that in the applicant’s community impact statement it states that Council did not respond. Council has since written to the applicants lawyers, Back Schwartz Vaughan, and advised them that Council responded directly to the Liquor and Gaming NSW. Back Schwartz Vaughan have acknowledged receipt of Council’s notification to them. Council submission was based on the previously submitted submission from 2014. Cr Cathy Griff enquired about a policy governing trees and planting in public spaces and it appears that Council so far lacks a policy in this area and noted this subject covered a lot of areas within Council. Cr Griff asked could staff provide some information about how such a policy might be developed the steps and approximate timeline to deliver such a policy? Around trees in road reserves and planting in public areas. Gaps include lack of articulation in regard to planting, maintenance, species selection, benefits of shade, views and risk management. Council is looking, as part of the 2018/19 Delivery Plan, to run a specific project to develop a tree management policy and strategy for Council managed land. There noted there would be a workshop with Councillors on this matter within the first quarter of 2018/19 to look at the guidelines to develop that policy. Cr Nadin asked would the policy include Crown Reserves. The Acting Director, Assets and Operations clarified the Policy would be for Council owned and Council Managed land, and could include Crown Lands managed by Council. The General Manager advised that Crown Lands would normally have a management plan already in place. Cr Griff asked about the opportunity for community members to have input into the Policy. The Acting Director Assets and Operations advised that once the Policy was developed as a draft there may be an opportunity for consultation at that time. Cr Russell Fitzpatrick asked for an update of current policy of agglomeration in regard to section 64 and sewer charges and establishment of proposed sewerage outfall in Merimbula and would there be any changes to the agglomeration policy? The General Manager responded that for Section 64 Charges these were recently reviewed by IPART. Agglomeration is still permitted as long as charging is equitably across all areas. Council is updating its Strategic Business Plans for Sewer and Water. Any new Delivery Service Plans (DSPs) will be developed to comply IPART recommendations and will include agglomeration. She advised that in regard to Sewer Charges, access charges are the same for all users. The Merimbula Ocean Outfall is a State significant infrastructure project. Significant reserves have been set aside to fund Council’s portion. The objective is to progress to State and Federal funding for the project. There will be consultation in Merimbula this coming weekend on the project and will include the opportunity for the community to have their say. Cr Jo Dodds asked what is the cost to Council of the tendering/sale processes thus far, relating to the Hotel Australasia? Cr Jo Dodds said people accessing the Merimbula beach in the vicinity of Council's ocean outfall pipes have reported unpleasant smells and concerns about machinery on the beach at night. Can we be updated about water quality and any related Council activities in regard to the current outfall. Acting Director, Assets & Operations, Mr Ian MacFarlane responded that since 19 December 2017 effluent from Merimbula has gone through dunal exfiltration, that is underground. The pipework has not been used since that time, Council has not records of any machinery on that area of the beach. Mr Macfarlane advise he had documents detailing daily testing, showing no evidence of spikes in the data to indicate there have been any problem in that area. Cr Robyn Bain noted a previous report to Council regarding the costs to Council of continuous requests from the Bega Valley Shire Residents and Ratepayers Association (BVSRRA) under the Government Information Public Access Act and asked could Councillors be provided with an update on the costs to Council for requests from the BVSRRA in the last 18 months. The question was taken on notice by the General Manager. There were no reports for adoption. There were no reports to declassify. There being no further business, the Chairperson closed the meeting at 4.38 pm. Chairperson of the meeting of the Bega Valley Shire Council held on Wednesday, 14 March 2018.